Food, wine and sports – just three things that Italy is known for and many more will be promoted as a celebration of Italian cultural heritage at this year’s World Travel Market. Italia tourism as an Official Premier Partner at WTM 2017, chose Sherbet Taxis to enhance its appearance at the event and on the streets of London. For this campaign our taxis feature supersides, branded tip seats and receipts to advertiser Italy as top holiday destination this winter. Our stunning Italy taxis will be available for display throughout the whole event, as well as professional footage showing how one of our Italy taxis was wrapped with the advert. 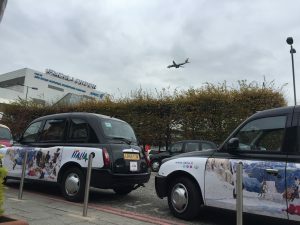 Italia are also using their branded Taxis to taxi their VIPs from their hotels and airports to the Excel centre in London. 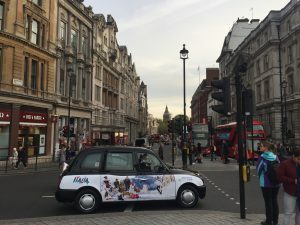 Sherbet Media offer PR opportunities for all brands to use their taxis at their own discretion via pre-booked fixed fares. Their VIPs get to travel to the World travel market in their own Italian branded London taxis.